President Moon Jae-in on Wednesday headed to Singapore following a state visit to India. Moon is scheduled to hold a summit with Singaporean Prime Minister Lee Hsein Loong on Thursday. 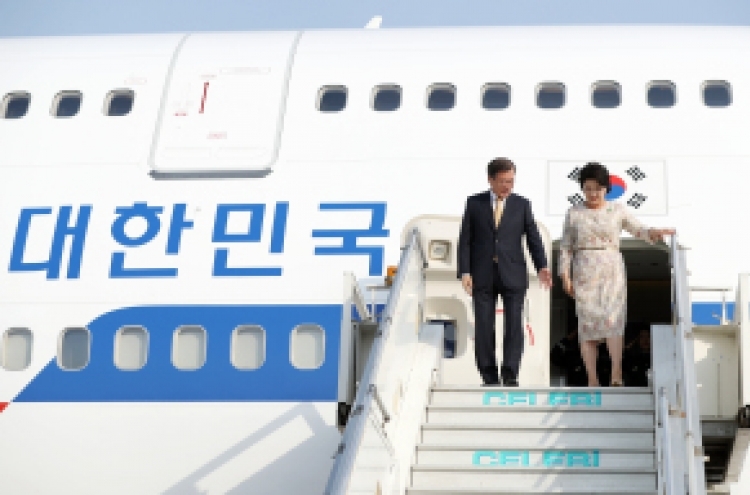 Following the summit, Moon and Lee are scheduled to attend a signing ceremony for a memorandum of understanding between the governments and other organizations of the two countries, and hold a joint press event. Ahead of the summit with Lee, Moon will meet with Singaporean President Halimah Yacob. 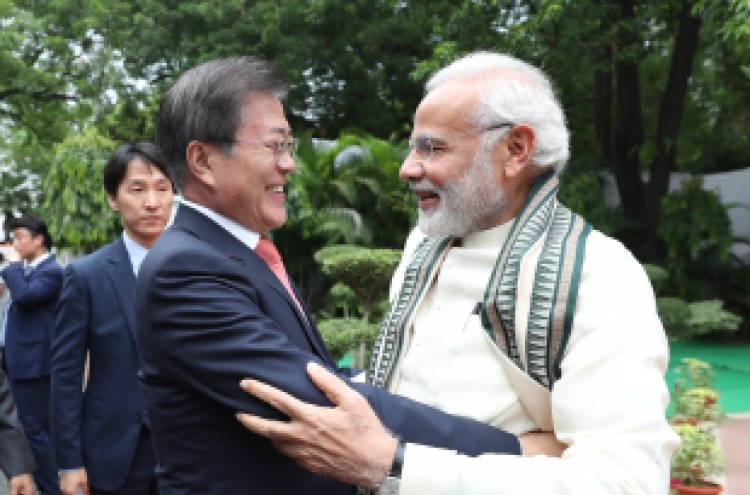 Moon’s New Southern Policy, a policy of expanding economic and political ties with South and Southeast Asian nations, is expected to be at the center of the trip, as it did in India. According to Cheong Wa Dae, Moon hopes to establish grounds for closer cooperation with Singapore with regards to the fourth industrial revolution during the visit. 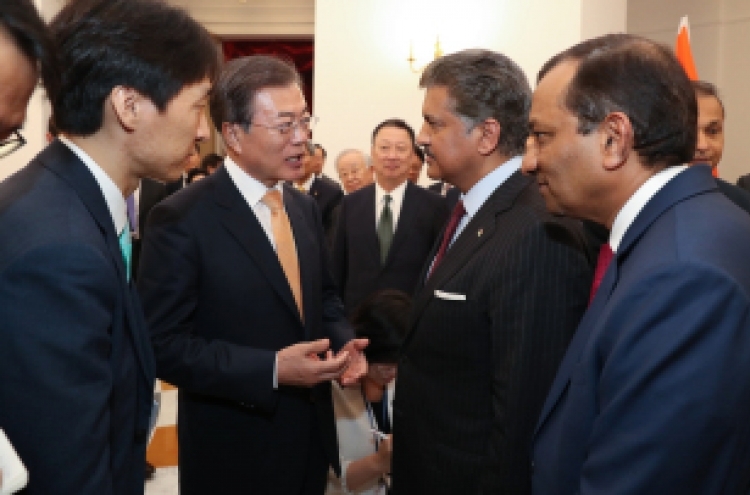 “Through the state visit to Singapore (Seoul) plans to develop future growth engines to respond to the fourth industrial revolution with Singapore, a leader in advanced industries,” Moon’s senior economic aide Kim Hyun-chul said ahead of Moon’s departure from India. Kim added that Moon will also put forward a model for the future of Korea-ASEAN cooperation, and seek to work with Singapore in developing cooperative projects. Moon dedicated much of his four-day stay in India to business and economy-related events, attending business forums and the opening of Samsung Electronics’ new plant in the country. In addition, Moon and Indian Prime Minister Narendra Modi adopted a joint declaration outlining plans for strengthening ties in a wide range of fields, including bilateral trade with the aim of boosting trade volume to $50 billion by 2030 from the current $20 billion. During his stay in Singapore, Moon will also attend an orchid naming ceremony, where a specially cultivated orchid will be named after the South Korean leader. As he did in India, Moon will also attend a business forum, and attend a state dinner hosted by the Singaporean government. On Friday, Moon will give a speech to some 400 opinion leaders of Singapore where he is expected to present his views on peace and economic cooperation in Asia. Moon’s trip to Singapore will wrap up with a lunch meeting with Korean citizens living in the country.